In this study, blood cell traits were collected from each strain in the HMDP panel which consists of 100 mouse strains. Using EMMA(10.1534/genetics.107.080101), we identified associations with these traits. The main advantage of the HMDP compared to the traditional genetic cross approach is the increase in resolution of the association. 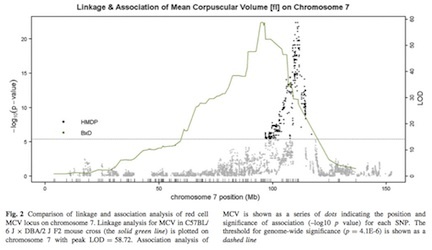 We identified a particularly striking association with mean corpuscular volume (MCV). The figure from the paper shows both the manhattan plot for the HMDP as well as the linkage plot from a genetic cross examining the same trait for chromosome 7. This example clearly shows the advantge of the HMDP compared to the cross in terms of resolution of the association. The peak is less than 1 Mb from Hbb-b1 which has been previously suggested to affect this trait. Some reviews covering the HMDP and mouse genetics more broadly are available here.